This iExpression aligns layers in a row. 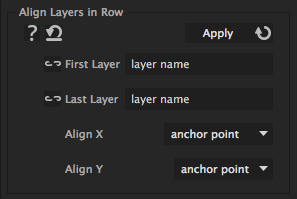 You just need to specify the first and last layer and all layers inbetween area placed automatically (if you have applied this iExpression to their position). is the name or index # of the first layer that should be aligned. is the name or index # of the last layer that should be aligned. determines how to distribute the layers in x direction. determines how to align the layers in y direction.